Customers rush to the aid of a woman who set herself on fire. 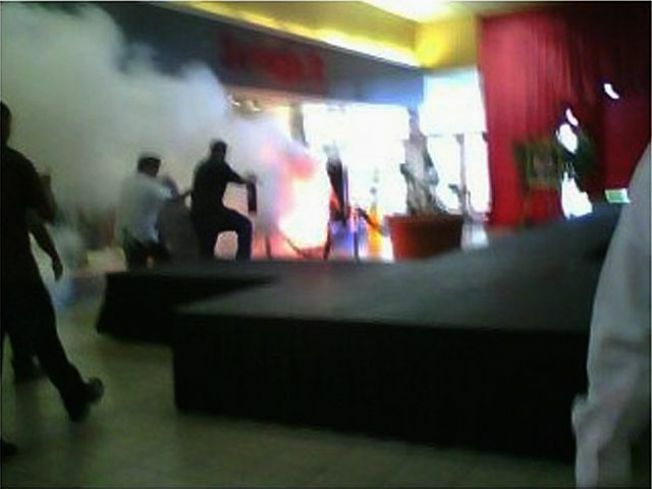 A woman walked into a crowded Miami mall on Thursday and lit herself on fire as shocked shoppers watched in horror. But it turns out 42-year-old Cecilia E. Casals had some serious demons burning inside of her. According to her husband, Casals had mental issues and had recently spent extensive time seeking psychiatric help. But court records also show that Casals had legal woes as well and was accused of attempting to kill her ex-boyfriend in 2004 and was still on probation on drug trafficking charges from 2008. The attempted murder charge was dropped. It's still unclear what happened to force Casals into the graphic public suicide attempt at the Mall of the Americas. She walked around the mall while lit and evetually made it out of the mall and into the parking lot, according to witnesses. Several concerned people who saw the amazing and disturbing sight were burned while trying to put out the flames. Witnesses said Casals was completely engulfed in flames and her clothes were melted off, yet she did not scream. It was like a scene from a movie, said one man who had his hands burned when he tried to help the woman. "It looked like a big fireball," eyewitness John Torres said. "I know she lost all her clothing." Casals was eventually extinguished before she left the mall but still managed to make it to the parking lot where Miami-Dade fire rescue personnel found her with severe burns over most of her body. She was transported to Jackson Memorial Hospital with what is considered life-threatening injuries. She is currently listed in critical condition with third-degree burns over more than 75 percent of her body. Investigators believe this was a suicide attempt known as self-immolation.